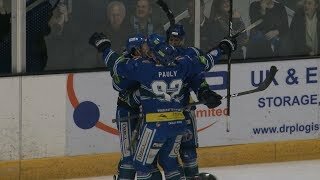 In a packed out Skydome Arena, the Genting Casino Coventry Blaze beat the Cardiff Devils 3-1 in the final game of the Elite League regular season, denying the Devils a third consecutive championship, seeing Belfast Giants crowned league champions. A day after securing a post-season play-off spot with victory over Manchester Storm, the Blaze got off to an almost perfect start, taking the lead at 3.49 when Norwegian defenceman Nicolai Bryhnisveen fired home for his twelfth league goal of the season. The referees largely put their whistles away and let the two sides play, although Blaze forward Ben Lake and the Devils’ Charles Linglet both found themselves in the penalty box for roughing at 8.44 following an altercation near the players’ benches. The second period saw the Blaze extend their lead when British defenceman David Clements found the net for just his second league goal of the season at 21.01. However, the Devils struck back through young British forward Sam Duggan at 28.10 to halve the deficit. The third period began with the Devils pressing for the all-important equaliser, but they were unable to find a way past Blaze netminder, and Man of the Match for the second night running, Matt Hackett who stood firm under intense pressure from visitors. 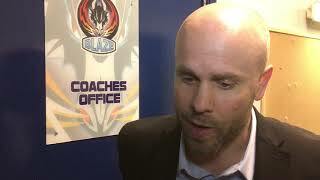 With Cardiff pressing forward, the Blaze were presented with a golden opportunity to extend their lead when they awarded a penalty shot at 52.53 after Swedish forward Thom Flodqvist was hauled down whilst through on goal. However, Flodqvist’s resulting penalty shot hit the frame of the goal keeping the score at 2-1. As the clock ticked down and Cardiff looking for the point that would secure the league title, they pulled netminder Ben Bowns in favour of the extra attacker. But, it was the Blaze who found the net, and fittingly it was Player of the Season Ben Lake who registered the empty net goal for his 34th league goal of the campaign, sending the home fans into raptures and the league trophy over the Irish Sea.